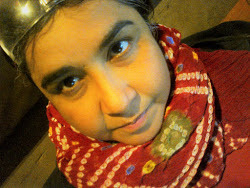 In June 2013, the Delhi Police Commissioner was required under at least three Delhi High Court orders to provide protection to General Electric Company whistleblower Seema Sapra. 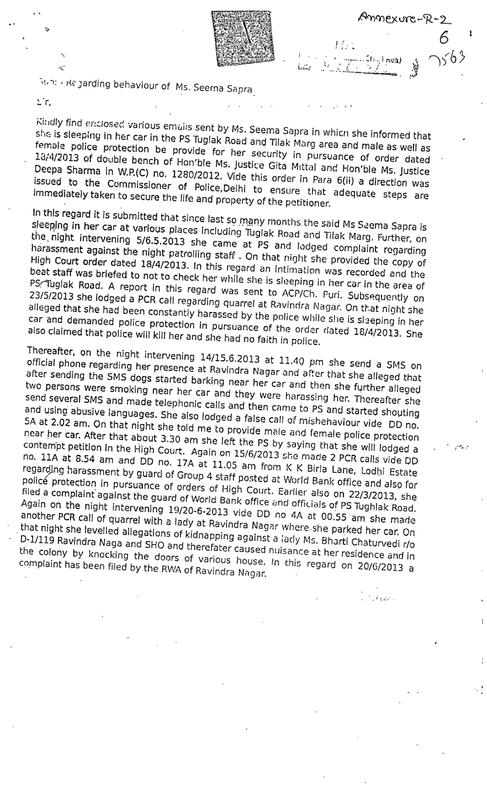 The Delhi Police did not comply with these orders and did not provide protection to Ms Sapra. Instead she was subjected to daily and nightly harassment and targeting at the hands of the Police. And subsequently the Police fabricated police records and filed a false report in Court leveling false allegations against Ms. Sapra. On the night of 14/16 June 2013, the SHO of Tughlaq Road Police Station Ajay Gupta told Ms Sapra to sleep in the police station for the night when she asked that the Police protect her. An attempt was made to have Ms Sapra abducted from her car in Rabindra Nagar on the intervening night of 19/20 June 2013 which was facilitated by SHO Ajay Gupta and the wife of an IPS/ Intelligence Bureau officer living in Rabindra Nagar Ms Bharti Chaturvedi. On the night of 1/2 July 2013, a mob comprising of policemen and relatives of policemen living in the staff quarters of senior police officers residing in Rabindra Nagar was used to attack Ms. Sapra. Then SHO of Tughlaq Road Police Station Inspector Ajay Gupta acting with the knowledge and encouragement of hir superior officers, actively participated in and facilitated these attacks on Ms Sapra and behaved towards her inappropriately, aggressively, and rudely when she complained and demanded compliance with the court orders. In order to cover up their contempt of court, the Delhi Police filed a false status report in the Delhi High Court on 18 July 2013 which contained bald and unsubstantiated false allegations against Ms Sapra and copies of some police records fabricated to target Ms Sapra. One of these fabricated police records is a note dated 22 June 2013 allegedly signed by then SHO Ajay Gupta which is at pages 7563 and 7564 of the court record in Writ Petition Civil 1280/ 2012. 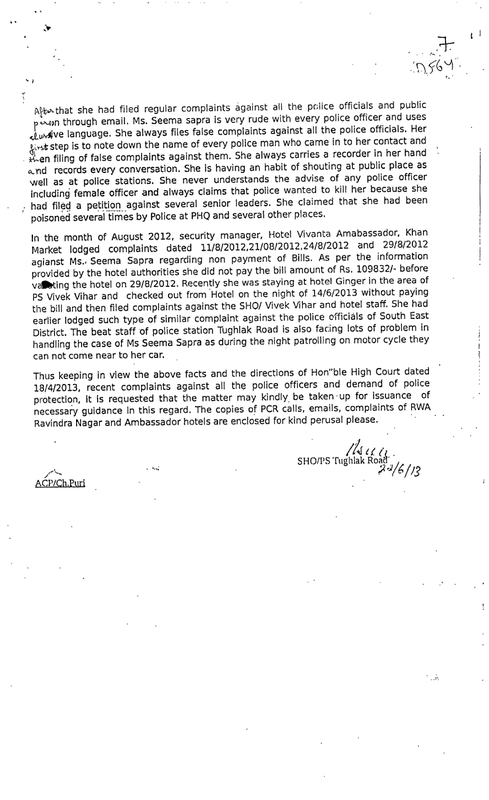 This note is reproduced below and is replete with false statements targeting Ms Sapra. In particular note the language of the first paragraph of the second page of this note which is deliberately worded to depict Ms Sapra as unreasonable and out-of-control. Luckily SHO Ajay Gupta went over-board and included a falsehood which can be easily refuted with documentary evidence. 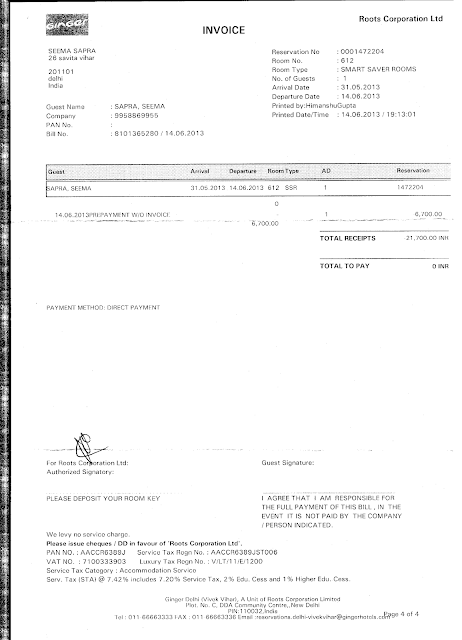 The bill and receipt from Ginger hotel Vivek Vihar dated 14 June 2013 (reproduced below) shows that Ms Sapra cleared her bill and did not owe any money to Ginger hotel, Vivek Vihar. The SHO Vivek Vihar was present at her request when Ms Sapra cleared her bill. In fact Ms. Sapra left Ginger Hotel because she was being poisoned there by toxic chemicals being released into her room. She made police complaints of such targeting at Ginger hotel. 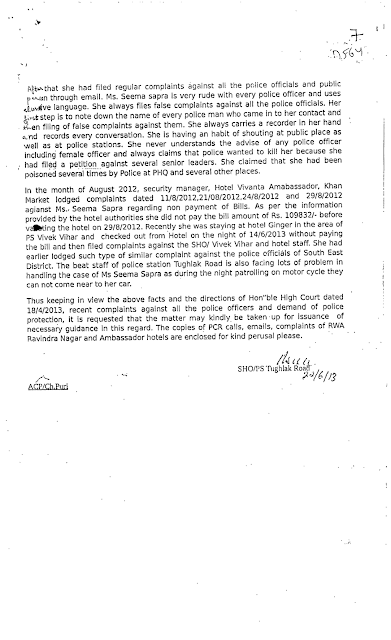 Besides the obvious falsification of police records by SHO Ajay Gupta as exposed above, there is ample documentary evidence including photographs, audio and video records, PCR call records, emails, text messages, hand written police complaints etc to establish the targeting of Ms Sapra by Delhi Police in June and July 2013. This evidence also establishes that to cover up its non-compliance with court protection orders and its targeting of Ms Sapra, Delhi Police officers fabricated police records, procured false complaints, and leveled false allegations against Ms. Sapra. Falsified Delhi Police note dated 22 June 2013 allegedly signed by Inspector Ajay Gupta, then SHO of Tughlaq Road Police Station. 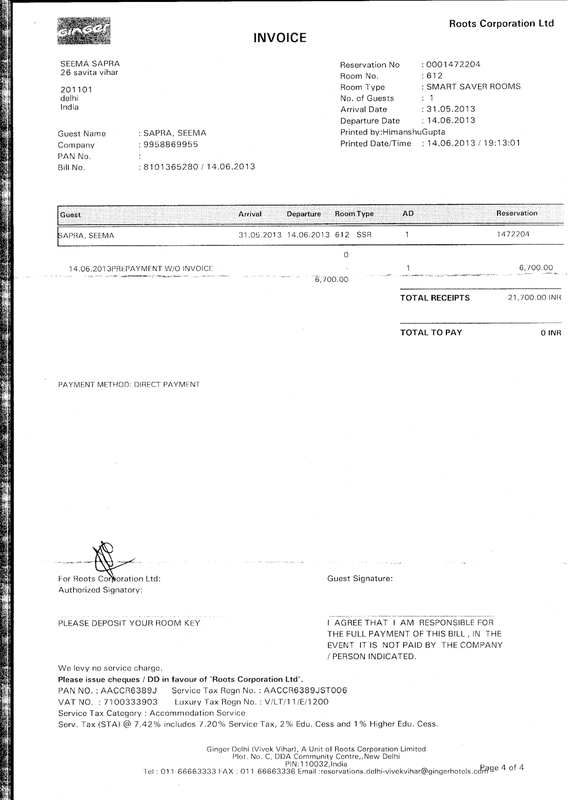 Invoice of Ginger hotel showing that Ms Sapra had cleared her bill.